Incepted in 2003, Midas Autosoft Engineers Private Limited is one of the leading Manufacturer, Exporter of all types of Industrial Weighing Systems, Batching systems, Process Instruments, Process Automation that includes Tank/Hopper/Vessel Weighing, Ladle Weighing, Crane Weighing, Platform Weighing, Bag/Drum Filling, Check Weighing, Vibro Feeder, Process Instrumentation, Screw Weigh Feeder, Chemical Process Instrumentation Belt Weighing and Weigh Feeders. We undertake turnkey projects for industries like Steel, Ferro Alloys, Glass, Food, Chemicals, Petrochemicals, Cement, Beverages, Sugar and also pharmaceutical industry. Further, we also supply Sensors, Controllers, Load Cells and Indicators that are imported from the reputed and trustworthy vendors of Israel, USA, and Italy. Midas Autosoft was formed with the sole aim to provide the world-class weighing and batching solutions to various industry segments. Promoters of Midas Autosoft Engineers Pvt. Ltd. have earlier worked with prominent industries like Industrial Automation Division of Phillips, India for about 15-20 years. Our team of directors includes Mr. N.B. Thite, Mr. G.G. Latne, and Mr. N.N. Pant. They have rich experience in Design, Engineering, Manufacturing, Sourcing, and Erection and commissioning of various process automation and industrial weighing applications. We initiated with the aim to become Project Engineering group for small and medium scale Process Industries in all type of Industrial Weighing and Batching systems, Process Instruments, Process automation. With our in-house CAD/cam facility, we are able to customize our range of systems as per the specific requirements of the clients. By constantly delivering quality products and services, we have reached a turnover of Rs. 6 to 7 Crore in the last financial year. Apart from India, we are successfully catering to the requirements of international clients in countries like Bhutan, Oman, Africa and others. We offer a wide range of weighing and batching systems which includes Tank/Hopper/Vessel Weighing, Ladle Weighing, Crane Weighing, Platform Weighing, Bag/Drum Filling, Check Weighing, Belt Weighing and Weigh Feeders. These cater to the need of Glass, Ceramics, Chemicals, Steel, Soaps & detergents, Food & beverages, Pharmaceuticals and Ferro alloy industries. Driven by the customer-centric approach, we also provide our range as per the customized specifications laid down by our clients. In addition, we also import a wide range of Sensors, Controllers, Load Cells and Indicators from some of the reliable manufacturers of Israel, USA, and Italy. Quality is one of the main concerns we lay emphasis on. Our team of quality and testing experts closely scrutinize the complete manufacturing process to ensure avoiding any discrepancy throughout. We have also set up a highly sophisticated quality testing facility to ensure defect free products at clients end. We acquire our products from reliable and quality oriented vendors. Hence, quality of the products is guaranteed. The stock of products procured by us is quality inspected at the vendor’s premises. Managed by professionals, the company has earned huge success in its work field and has a huge client base. Our clients are spread across the domestic as well as overseas market. We consider our clients as the best promoters of our products. Hence, we provide them with the quality assured products and deliver the consignments in the stipulated time. Over the years, we have gained expertise in manufacturing all types of Industrial Weighing Systems, Batching systems, Process Instruments and Process automation. These products are manufactured by us using the best grade raw material which is procured from the well-known vendors of the industry. Having in-house CAD/CAM facility, we are able to design and develop our products to meet the exact requirements of the clients. With the help of our experienced and dedicated team of personnel, we also undertake turnkey projects for industries like Steel, Ferro Alloys, Glass, Food, Chemicals, Petrochemicals, Cement, Beverages, Sugar, pharmaceutical etc. For this, we meticulously undertake all the work from designing to manufacturing and commissioning to the installation of these projects. Having achieved expertise in manufacturing high-quality products, we have diverted our efforts towards providing 100% satisfaction to our clients. Our business processes also involve offering effectual after sale services for our range of Industrial Weighing Systems, Batching systems, Process Instruments, Process automation and other turnkey projects. This includes proper installation and commissioning of the systems. Further, we also provide repairing of these systems as per the demand of our esteemed clients. Quality products with timely delivery have resulted in receiving huge accolades from our global clients. Advanced infrastructure coupled with our industrial expertise has helped us in satisfying the clients' specific industrial requirement. Our commitment to delivering only best products at a competitive price has resulted in the large customer base on nationally as well as international level. Quality is a prime motto of our company thus we source our products from legitimate vendors. 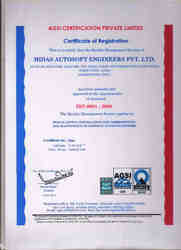 We have the association with various vendors in the country. They are some of the trustworthy and legitimate names in the industry. We have a team of skilled professionals who make sure that we procure the products from the best of all. We analyze the vendors on certain parameters and then only we place our order for the required products. We are renowned as one of the leading suppliers of Industrial Weighing Systems, Batching systems, Process Instruments and Process automation. We have a huge client base across the country.